Bold Palates describes how, from earliest colonial days, the nation’s cooks have improvised, invented, adopted, transformed and domesticated indigenous foods and ingredients as well as Australianised foods and recipes from other countries. It also tells the stories behind the foods and recipes and the ways of cooking and eating that represent characteristic Australian responses to unique Australian situations. In doing so Santich, an internationally acknowledged authority on food history, guides us towards a deeper understanding of Australian identity by examining what, and the way, we eat. Why was damper or its smaller sized equivalent Johnny cakes so popular in the early days? What makes our picnics and barbecues characteristically Australian? Why are pumpkin scones, Anzac biscuits, Pavlova and Vegemite Australian icons? How did eating lamb become a patriotic gesture? Why are Australian cooks so ready to experiment, adapt and innovate? Is or was there ever a National dish or Australian cuisine? All these questions and many more, are discussed providing often unexpected answers. The story takes us from early colonial days when Kangaroo steamer, Parrot pie, damper and tea were the standard fare to the 1950s when the lack of dishes representative of Australia and symbolising Australian identity was still being deplored to today’s fast food outlets of hamburgers, coke and Kentucky Fried Chicken. It took some time for the early settlers to try native foods but when their European supplies ran out, desperation forced the issue. Many early explorers owed their lives to eating native foods while others often died of hunger surrounded by an abundance of it. The lack of appetite for native foods is commonly blamed on the attitudes of our European ancestors who, in the same way they viewed the Natives as primitive and inferior beings, reputedly rejected out of hand the foods that, for millennia past, had sustained them. Early South Australians were a little better and as early as 1845 Clement Hodgkinson of Adelaide reported that settlers had pushed up the price of kangaroo meat to an extraordinary nine pence per pound. Mary Thomas was also adventurous and had parrot pie for Christmas in 1836 while Theresa Chauncey had cockatoo soup and parrot pie a year later. Parrot pie was still popular in the early 1900s. It did not take all that long either before cooks experimented with magpie, ibis, kangaroo rat, flying fox, bandicoot, echidna and wombat. If the native fauna was hard to get used to, indigenous plants proved even harder. The strangeness of many native plants with their miniscule fruit was often a barrier to consumption. However settlers in the Adelaide Hills relished the tubers of the yam daisy and quandongs, wild raspberries and native currents, which were abundant near the Murray mouth, and on Kangaroo Island and the Barossa. Domestic experimentation took off quickly and by the late 1860s women were urged to make wine from the rosella fruit. Cook books were common and one of the first published jam recipes appeared in the Barossa Cookery Book. The Yankalilla show of 1861 included a section for pie melons and melon jam. In 1862 George McEwin operated a jam factory and orchard in the Adelaide foothills. That same year Australian tomato sauce was exhibited at the Great London Exposition. Disenchantment with indigenous foods accelerated in the 20th century. As Australians became more urbanised they also became estranged from bush foods. Even so, the 1955 South Australian CWA calendar of meat and fish recipes still included roast galah, baked wild duck, wallaby pie, kangaroo steaks and pigeon pie. The 1957 book Oh for a Man who Cooks gave recipes for kangaroo steak, roast kangaroo, wild rabbit and ducks braised in red wine from the Mount Pleasant vineyard of Maurice O’Shea. As we well know, Australians like their cakes, lamingtons, sponges, scones and Anzac biscuits. In the chapter, aptly named Land of Cakes, we learn that making cakes offered the ideal opportunity for the feminine imagination. Women were also the authors, editors and compilers of virtually all cook books published before the 1850s. Australian cooks showed their creativity by taking advantage of new flavours and incorporating these into the old favourites, including passionfruit and coconut. Coconut was imported from Ceylon and Fiji from 1885 onwards. In 1909 Australia imported more than 100.000 pounds of it. Cornish pies and pasties were brought in by the miners from Cornwall in the 1840s but the Chiko Roll was an Australian invention of Frank McEnroe of Bendigo in 1851. By 1973 annual sales reached 65 million. The meat pie though held first place still with sales of some 260 million a year. It originally came from England where it had been eaten since the 14th century. They were sold by itinerant pie men but were soon available from pie carts, penny-pie shops and coffee stalls. In 1861 a coffee stall was operating in King William Street, Adelaide and by 1890 they also sold the famous pie floater. By 1900 it had six coffee and pie stalls. Another unashamed imitation was Vegemite, copied from the English Marmite in the 1920s. From the 1970s a different range of motives, environmental, political, social and cultural inspired a renewed interest in indigenous resources. The CSIRO began research into quandong varieties and Limpinwood Nursery established a selection of bush food plants. Andrew Fielke launched the first Red Ochre restaurant in Adelaide in 1992 featuring kangaroo, emu and magpie goose. According to Santich we have an obligation to incorporate at least some indigenous food into our food culture, not simply because they are particular, indeed unique, to this country but because doing so honours the land that produces them as well as the people who, over hundreds of centuries before white settlement, made them part of their culture. The book also deals with the way we eat and where. In the chapter Land of Picnics we learn that picnic is derived from the French pique-nique and entered the English language during the 1850s. In Australia it was at first referred to as gipsying. The popularity of picnicking in the bush was one of the reasons for the establishment of recreation and conservation reserves in South Australia in the 1880s of Morialta, Waterfall Gully and Brownhill Creek. Soon family picnics were joined by organised large group picnics with travel by steamer, train or car. Favourite occasions were the Christmas, New Year and Easter picnics. More than 4000 people attended the Boxing Day picnic at Beltana near Hobart in 1892. The picnic was often the preferred form for large scale celebrations which in turn gave rise to the quintessential Picnic Races. When meat was plentiful and chops cheap the chop picnic enjoyed a burst of popularity through the 1920s and 1930s with Belair National Park the preferred spot. It was the forerunner of the Barbecue. The barbecue and sausage sizzle have become emblems of Australian hospitality. Barbecue was imported from America where it was already popular in the 1850s with males in charge of the cooking. Both picnics and barbecues were made even more attractive by the truly Australian invention of the Esky. Australians share an honourable gastronomic heritage, which according to Santich has nurtured a distinctive food culture. They have developed individual culinary traditions by reinventing customs and practices originating in other countries and cultures. Some of the best examples being American sealers, German farmers, Chinese gold diggers and the Afghan cameleers. Whatever suited the settlers they adapted to their own new circumstances. 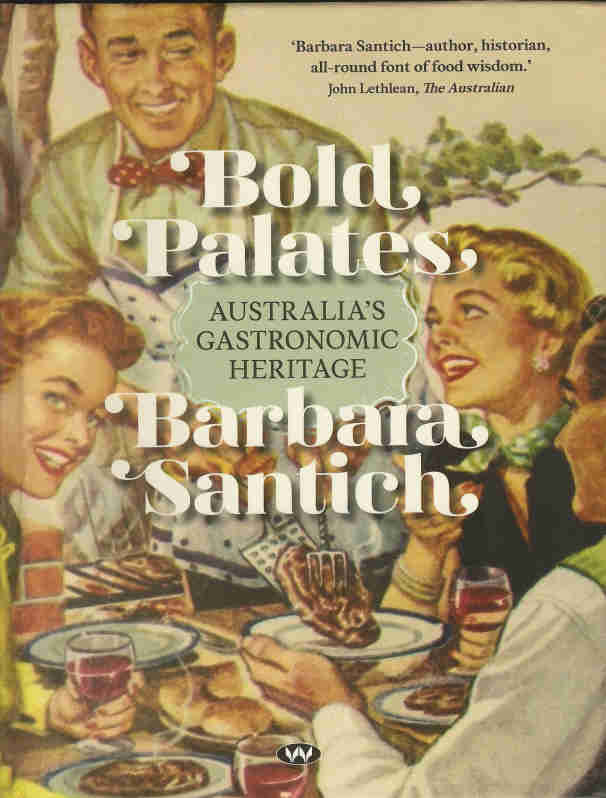 Santich's book establishes a solid foundation to the attitudes and practices typically seen as characterising Australian and Australian food culture today. Prime Minister Julia Gillard and Arts Minister Tony Burke have announced the 2013 Prime Minister’s Literary Awards shortlists. Now in their sixth year, the 2013 shortlists recognise the best in Australian fiction, poetry, non-fiction, history, young adult and children’s fiction published in 2012. It includes Bold Palates. A tax free prize of $80,000 will be awarded to the winner of each of the award categories. Shortlisted entries receive $5,000 tax free.